Keys is the subtitle of Matt Owens’ performance at St Ann’s Church, and there, squeezed in front of the altar-rails beside a grand piano, electric keyboard, two microphones and a tangle of cables, is a sculpture of keys hanging on strings. This is a sure indication that Kirsty Almeida is involved, because Kirsty excites creative energy across the boundaries. And so does Kirsty’s long-standing accomplice, Matt Owens. There is no doubt that Owens is a excellent bassist and peerless accompanist, but his own music is rich with a sense of limitless possibility. The opening piece - David Muñoz on piano and John Ellis on keyboard flank Owens on upright bass – sounds like the theme from some lush, glamorous and exciting film, perhaps made in the sixties. Rather prosaically, it has the working title, ‘New Idea’. The next piece, again freshly minted, is a tune with a gospel flavour called ‘Ray’. Its dedicatee is visible in the apse to the side, listening intently, and cradled in his mother’s arms. Then Kirsty puts down little Ray, takes a few steps to the altar front, and proceeds to sing a luminous new song called ‘Restless’, with music by Owens. It’s clear by now that Matt Owens has a genius for swooning melodies and is a pastoralist in the venerable musical tradition of George Butterworth, John Taverner and Mike Westbrook: his prowess on bass is just an incidental spin-off. The realisation dawns on everyone in St Ann’s Church: this is my lucky day. And fortune continues to smile: with a playful piece described as “Tchaikovsky meets tango”, a spiritual invocation on which Ellis plays the church organ (an especially memorable moment, this) and an exploration of Latin America in tandem with pianist David Muñoz, who, with bursting heart, offers an unpremeditated autobiographical sketch (born in Chile in 1973, a terrible time and place). It’s less like a concert and more like being clasped to the bosom of an affectionate family, the experience was so intimate and, at times – like the communal singing during ‘Going Back to the Village’ – a sweet, sweet embarrassment. Papanosh (Festival Pavilion) are so French. But how? I mean, they eschew obvious signifiers like berets and striped jerseys and all those other silly cliches. Yet the fact remains: their music owes nothing to USA jazz, and precious little to British jazz. They have that peculiar Gallic attitude to pleasure, and abandon themselves with more intensity and strenuousness than the English have ever felt comfortable with. Their enthusiastic embrace of anarchy, too, is very French – the music is characterised by theatrical swerves of tone. And the idea of life as a carnival, and the circus as an apt metaphor for life’s absurdity: well, that is part Antonin Artaud and part Jacques Tati, and finds expression in the band’s freakish, fantastic inventiveness. Sebastien Palis’ organ is a surreal art object in itself, with its trailing wires and twinkling valves (it sounds great too, when he begins to play). Raphael Quenehen is a brilliant saxophonist, at one point blowing two horns simultaneously, just like Roland Kirk. And Quentin Ghomari, doubling on trumpet and trombone (though not at the same time), has an acute grasp of dynamics and engineers some mercurial changes. Of all the events at this year’s Manchester Jazz Festival, this is the one I would most like to relive, if the chance should come again. I was the person nodding off in the front row. The modus operandi of the much vaunted Beats & Pieces Big Band (Festival Pavilion) is clear by the second number: big, brassy and populist, albeit with traces of ambiguity that hint at the genuinely radical. Once in every generation in every major conurbation in the developed world, some visionary musician will gather together the most conspicuously talented players of his generation and run with it. The readiest comparisons to Beats & Pieces in Manchester in the twenty-teens (is that the proper word?) would be Loose Tubes in London in the eighties, or the Stan Kenton Orchestra in L.A. in the fifties. Really, there is a comparable wealth of talent – Sam Healey on saxophone is a real fire-breather, and I was impressed by trumpeter Nick Walters’ ability to surf the cacophony. The evident excitement and anticipation in the Pavilion is not confined to the audience alone. The fourteen musicians of Beats & Pieces gratefully seize the opportunity to transcend small group confines. The second half is all new, and exhilarating in its balance of large-scale musical concepts and individual freedom: though the charts were very complicated, there were only three music stands on stage. The unexpected appearance of David Bowie’s ‘Let’s Dance’ is a sop to populism. And dance we did (some of us), despite the complexity and shifting rhythms, and the deafening sound of the band in full cry (another reference point might be Buddy Rich). The genial director Ben Cottrell orchestrates all the thunderous roar. No, I catch Parshmaune (Festival Pavilion), who reflect the sensory overload of the inner city with lightning juxtapositions, quotations, merging rhythms, evolving jazz funk and real-time interventions by Timmy Montague, with the woolly hat and headphones at the back, intently peering into his laptop. Actually, his input is not so obvious, but, at a guess, he’s responsible whenever a hollow clang emerges from Tyrone Isaac-Stuart’s otherwise agile alto saxophone. There’s lots of urban immediacy, as when brief solos are exchanged, each topped with the ‘Here Comes the Bride’ jingle. This is presumably a comment on the constant steam of wedding parties emerging from the Town Hall opposite. Zuri Jarrett-Boswell, crouched over his keys, has the virtuosity to handle every situation, and Isaac-Stuart projects crafty mischievousness via his alto horn. His fellow saxophonist, Reiss Beckles, is a more diffident player. 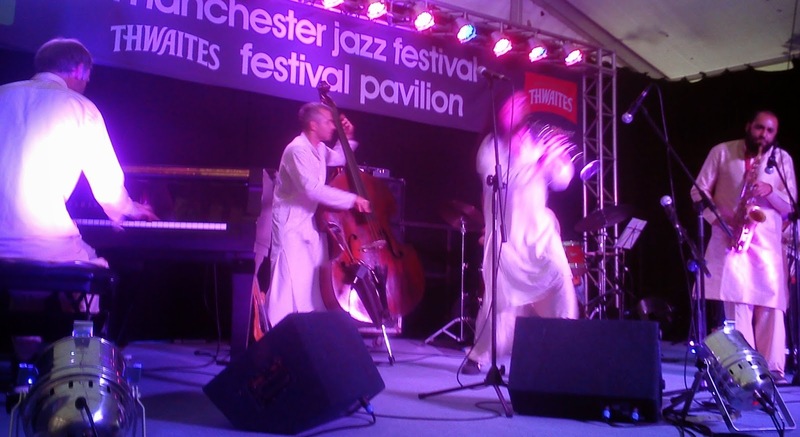 Jack Polley and Peter Hill (bass and drums) nicely dislocate the jazz funk conventions. Hearteningly, in Shirley Tetteh, the group contains that rare thing in jazz: a female guitarist. This means that Deirdre Cartwright and Kathy Dyson are no longer alone. Occasionally MJF will employ a cabaret singer to fulfil their populist brief. This is always a mistake. For the finale of the last Saturday of the Festival, nouveau soul singer Charlie Cooper lives her Beyoncé fantasy in the big tent (Festival Pavilion) to overwhelming indifference. The spectacle is so dispiriting that I leave before the Hackney Colliery Band, another post-modern New Orleans-style marching band, can turn the situation around. I and everyone else want to hear more of Sam Healey, who brought the house down at Beats and Pieces on Friday. But if the capacity crowd for the Sam Healey Quintet at the Fesitval Pavilion are, like me, expecting a blowing session shoot-out from the fastest saxophone in the West, we soon learn to adapt to a different reality. Healey tentatively lays out a theme on piano, and the musicians drift into a state of trance. The other mode is cathartic grandeur, which is the default mode of guitarist Stuart McCallum, which drummer Luke Flowers leavens with steamroller funk. Titles like ‘Death and Impermanence’ also set Healey apart from the common jazz herd. “I’ve never been good at titles,” he blushingly confesses. Here, his bravura technique is placed resolutely at the service of the sublime. After the show, jazz promoter Janet Higgins tells me that Healey, like herself, is a Buddhist, and suddenly the preceding events all make sense. She hands me a flyer for Healey’s upcoming date at The Slug and Lettuce (August 5th), and I promise I’ll be there. In contrast, the Paradise Trio (Festival Pavilion) offer something I’ve searched for all Jazz Festival, possibly all my life. In a word: jazz. ‘Paradise’ is the right word, because jazz at this level of accomplishment contains rich spiritual nourishment, with the three musicians embodying distinct yet sympathetic varieties of beauty? Richard Iles’ flugelhorn pours forth an unbroken thread of burnished grace in linear space; whereas pianist Les Chisnall is a harmonist, and a profoundly elegant one, and Mike Walker, as we can readily hear, is simply the most songful guitarist in the world. The feeling is of limitless resource, and power held in check. Walker, a force of nature when inclined, favours weightless chords that float in the air, and essays a plangent lyricism that is one of the most affecting sounds in jazz. The music is paradisal too because it represents an ideal of life: Iles’ ‘Appleton Avenue’, Charlie Chaplin’s ‘Smile’ and, especially, Walker’s ‘The Clockmaker’, are luminous, transient moments to last for eternity. The last word, however, comes from The Music Place Choir (Festival Pavilion), a sixty-strong community choir from Altrincham with a programme of Richard Rodgers tunes. It’s one of those gigs that disarm criticism. This is partly because of the inspirational leadership of Clare Morel, the sense of togetherness exuded by the ladies and gentlemen of the choir, the deathless potency of Rodgers’ melodies, and, well, the undeniable fact that everyone present is having a whale of a time. Or, if they’re not, their fixed smiles give a reasonable impression that they are. It’s disarming too, because Richard Rodgers and Ivor Novella were my own mother’s domestic muses. She used to sing these songs about the house when we were kids. How interesting to probe into the source of the songs that come unbidden into our heads. Coincidence and the subconscious play a large part. ‘It Might As Well Be Spring’, for example, is a great song to accompany the ceremony of spring cleaning, although the spring cleaner with her mop and bucket might be oblivious to the connection. Similarly, my mum was very fond of he’s-rubbish-but-I-love-him songs like ‘Bill (He’s Just My Bill)’ , again for fathomless reasons. ‘Edelweiss’, from the Choir’s repertoire, is a song associated in my mind with my first brush against Nazis. The voices, effective in unison though fragile individually, are bolstered by a bona fide great voice in Alison Owen, whose flexibility and force derive from the more recent tradition of soul music, although the ladies and gentlemen of the choir are delighted to have her. There’s also a small jazz combo on hand, and again, t.l.a.g.o.t.c. are gratefully accommodating. The stirring, if secular, sound of sixty raised voices (plus audience) proclaiming, for the second time that afternoon, ‘Oh What a Beautiful Morning’ brings the 2014 Manchester Jazz Festival to a memorable close. Everyone agrees that it’s been a vintage year. Jaco Pastorius is the obvious role-model for any bass virtuoso who dares to elevate the instrument beyond its simple time-keeping role, although they might want wish to be spared his martyrdom. Carles Benavent is better placed than anyone to fill that Pastorius-shaped hole. Presumably Miles Davis, Paco de Lucía and Chick Corea thought so when they employed him. And he is less obviously tormented – as far as one can tell from his personable stage manner – and his cultural inheritance, which includes the richest of the Spanish flamenco tradition, transfers very nicely to the bass. Benavent’s bass playing is mellifluous, attractive, and fluid. 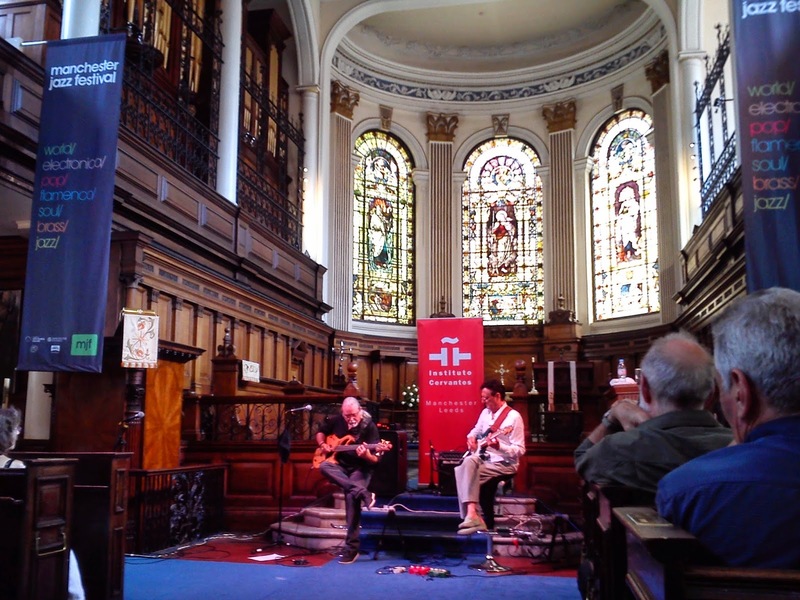 Sometimes he played in unison with his guitarist partner, Jordi Bonell, and sometimes he played in counterpoint, so the extraordinary profusion of notes not only doubled but multiplied: the effect was like riding on a bubbling current of rhythm. He played a song dedicated to Jaco Pastorius, and another one dedicated to Paco de Lucía called ‘De perdidos al río’, which, Benavent usefully translated, means “If you get lost, go to the river”. On ‘Por dioss’ Bonell tried out another guitar sound, which was fuzzier and dirtier (I wonder how they would sound on two acoustic guitars? As beautiful as Segovia, I expect.) The two men were now trading solos with implausible precision, and making a game of telepathy in their duets. A blues in bulerías rhythm turned out to be ‘Footsteps’ by Wayne Shorter. It was all very intricate, very busy, very Spanish and vastly enjoyable. You know this lot (The Imaginary Delta, RNCM Theatre) could have been the next Ukelele Orchestra of Great Britain if they’d listened to me. They had the potential to be quite as crowd-pulling, with music that drew on trad jazz (lovingly reinterpreting ancient jazz idioms with a freshness that came as an electric shock) and the hard-core avant-garde (albeit with all the portentousness and boring bits removed) . There was a theatrical element that could be developed, and the paranormal aspect was a unique selling-point – when the long-gone singer Victoria Spivey was summoned from blues Valhalla to join forces with the band: well, that was a priceless piece of coup de theatre to set alongside the elephants in Aida. Instead, The Imaginary Delta have reconvened for an evening of ‘jazz and poetry’. These dread words are usually an instant turn-off, but anything touched by Adam Fairhall, a homegrown autodidact and musical genius, is bound to be good. My faith is justified before even a note is played, when the wonderful vibes player Corey Mwamba makes an unannounced entrance alongside the other musicians. Hard to imagine it working as well with any other poet than Jackie Kay (except perhaps Nikki Giovanni). Kay has a modest bearing, a Scottish accent that exudes warmth, and an openness that cuts to the emotional heart. And she is a very good poet. Fairhall has provided settings for her series of poems about Bessie Smith. “Every note she sang, she bent her voice to her will,” ran one line. The same might be said of Kay, who overcomes her evident nervousness, and never misses a cue. The music is new, with Fairhall finding just the right sound textures for Kay’s images: say, Corey’s thumb-piano to suggest the desolation of the Deep South as Bessie’s Pullman trundles past. New, even when the stately ‘Arabian Fantasy’ triggers recognition with the avidity of the Imaginary Delta’s Greatest Hit. And here it is, the disembodied voice of Ivy Smith (Ivy, rather than Bessie), miraculously reconfigured by Paul J Rogers’ stick remote. New, I say, because the following solos by James Allsopp on bass clarinet, Chris Bridges on trombone (who has obviously absorbed both Roy Williams and Alan Tomlinson) and Steve Chadwick on cornet are fresh minted and of the moment. What is explicit in the poetry is implicit in Steve Chadwick’s horn, which combines elegance and immensity in a way that would be familiar to turn-of-the-twentieth-century New Orleans. Two pianists, or rather, a pianist and a piano trio divert me today. Alexander Hawkins (St Ann’s Church) draws equally on jazz and classical, as much Messiaen as Duke Ellington, but both are transformed by Hawkins’ bravura technique. He may dazzle with cascades of notes, or - such are the dynamic extremes - charm with a serene and airy lyricism. The music he extracts is rich, serious and elevated, and seems to belong in the beautiful and sacred space of St Ann’s Church. When he calms a bit, the listener catches echoes of the past – a glimpse of Gershwin, perhaps, or Mussorgsky offering Pictures at an Exhibition in some grand saloon. This, it must be said, is akin to the eye making out faces from the random patterns on an ancient mossy wall. Then something tangible emerges from the tonal thicket, and what’s more, it’s recognisably jazz: a fantastic re-imagining of ‘Take the A Train’. Hesitant at first, the train starts with spluttering, spasmodic runs before gathering speed at an alarming rate. It’s derailed a few times by fugitive rhythms, but that only adds to the excitement. And then in, short order, following the logic of free association and the community of jazz genii, Hawkins essays ‘Love in Outer Space’ by Sun Ra, replicating each part of the Arkestra, including the percussion, on one or more of the 88 keys of the piano, which, the way Hawkins plays, is a one-man Arkestra. His open-ended explorations last precisely the hour allotted in the schedule, and end as they began, with Hawkins bent under the lid of the piano, crooning “siii” and “saaa” into the piano’s interior, listening hard to the resonance. The Bad Plus enter the large stage of the dark auditorium of RNCM Theatre and pianist Ethan Iverson essays a simple theme of song-like simplicity; the bass enters; Iverson fills in the chords with atonal harmonies, reshaping the piece. David King, on drums increases the intensity with a splashing cymbal and emphatic backbeat. Now the tune is positively florid and King is giving it ten to the dozen, but the original tune can still be detected beneath the frenetic activity. The climax comes: pp suddenly follows ff (a favourite trick of The Bad Plus). The simple theme is restored in its dying fall. A snare beat signals finality; rapturous applause and whoops follow. This is ‘Pound For Pound’ by bassist Reid Anderson, and it characterises The Bad Plus methodology and The Bad Plus appeal. Anticipation sharpens about what will come next. ‘The Empire Strikes Backward’ (cute titles are another feature) has a trickier time signature and more strenuous activity, and illustrates the trio’s ability to deliver hummable melodies in 7/8 time. ‘Gold Prisms Incorporated’ utilises repetitive chords and boasts a pounding back beat, but the mock rock is subverted by a passage of free time and ascending chordal arpeggios are set to a dark, ominous drone. The music fractures completely, before the bombastic riff makes a conquering return, only to be superseded in another quick change by a new far-out rhythm. A bass solo climaxes this piece and more ravenous applause follows. And so it goes on. There were more players in The Imaginary Delta at last night’s concert in the theatre, but somehow the trio seem larger, and their presence expands to fill the space in inverse ratio to actual physical size. I ponder this during Iverson’s solo on ‘You Are’, a practical application of Bach-like mathematics to the chamber jazz format. Heads are now involuntarily nodding. Me, I think it was great as prog-rock but deficient as jazz, and, personally, I regard jazz as the higher art-form. The promised performance of Stravinsky’s The Rite of Spring didn’t materialise. I have mixed feelings about this. Ex-Easter Island Head (St Ann’s Church) seemed to have stumbled upon a new method of making music, which is quite an achievement at this stage of the game. 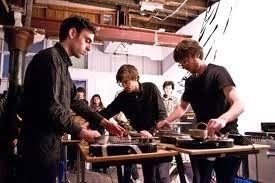 Benjamin D. Duvall, Jonathan Herring and Ben Fair lay electric guitars on a flat surface and beat them with mallets. There are a few refinements, which would be mysterious even if my view wasn’t obstructed in the 12th pew down: the direction the guitars face seems to be important, and the spot on the guitar body where the strike lands affects the sound. With an overlay of (conventional) percussion and augmented by discreet electronics, EEIH sound like a cross between a gamelan orchestra and Velvet Underground. It was extraordinary, and all the more valuable for providing a glimpse into a vibrant and hidden music scene, one totally off the London radar. Engine Room Favourites thrive in Sheffield and environs, and amount to nothing less than a revolutionary revelation! Of course, MJF has always been susceptible to high concepts, so when Tin Men and the Telephone (RNCM Theatre), a piano trio from Amsterdam, propose a technologically interactive, ideas-based performance, it meets with a ready response from the Festival promoters. Ideas like what? Oh, accompanying a Sharápova tennis match at Wimbledon, projected onto a screen backkdrop: a groovy vamp for when play is interrupted, and ‘Someday My Prince Will Come’ for sustained volleys. Or shaping melodies for a cut-up commentary from the recent World Cup (the words “de bal” featured heavily). Or, having successfully matched melody with human speech, attempting the same trick with a herd of cows (the bow of bassist Lucas Dols comes in handy here). In a nice touch, the on-screen cows turn their heads en-masse in the direction of the music. Best of all, audience members are invited to turn on their mobile phones and influence the performance according to some on-screen directions (“faster”, “bass solo”, “please stop now” etc.) The suspicion grew that the ideas were more interesting than the music, which was a bit like throwaway Bad Plus, but it was certainly entertaining. Diego Amador, described as a flamenco piano player (which would be something to see), is not having a good night. His original error, from which he never really recovers, is to share a double-bill with Tin Men and the Telephone. ‘John Barleycorn’, that most English of songs, sets the tone nicely. 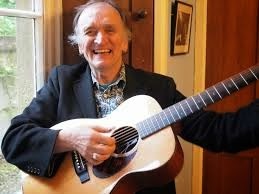 Seeing Martin Carthy in full flight, possibly at the same age the old-timers were when the stripling Carthy saw them (Sam Larner in ’58 at the Ballad and Blues Club was a life-changing moment, apparently), is both poignant and strangely heartening. With luck, dedication and long life, we might all become old-timers, just like our first idols. But whereas the original country singers seldom bothered with instrumental virtuosity and were content just to put the song across, Carthy has it all, as an enthralling storyteller with a distinctive, forceful guitar style. He’s also, undoubtedly, travelled further and performed more widely than Sam Larner, Walter Pardon et al. He’s as comfortable with an audience as you or I would be in a pub with some dear old friends, and his conversation is compelling. What did I learn? For one thing, Carthy got ‘Scarborough Fair’ from The Singing Island, a songbook compiled by Ewan MacColl and Peggy Seeger, and MacColl got it from Mark Anderson, a retired miner, in Yorkshire in 1947. Thus, with typical self-effacement, Carthy undermines his major claim to fame in pop culture (the unspoken message: yes, he taught ‘Scarborough Fair’ to Paul Simon, but he only had it from a book). This comes in the introduction to ‘The Bonny Moor Hen’, another song with an Anderson source. It’s characteristic of Carthy to sidestep the obvious too. A swift change of guitar, and a less swift tune-up, and Carthy confides that he was electrified when he read the first four and a half verses of the next song. This turns out to be ‘The Famous Flower of Serving Men’, one of those big ballads that Carthy specialises in, and a transforming song in every sense. It may be that the English folk canon rebounds in instances of cross-dressing, infanticide, magic realism, courtly intrigue and bloody revenge - but all in one song!? And note the strange stretching of time. The original atrocity is conveyed with the terseness and dispassion of an account by a shocked survivor. (“My mother did me deadly spite, for she sent thieves in the dark of the night…”) whereas retribution, when it comes, is lingered over and savoured in every detail (“the fire took first all on her cheek…”). Why only the first “four and a half verses”? Could it be that ‘The Famous Flower of Serving Men’, in its definitive form, is largely the product of Martin Carthy’s craft? The notes on the inner of Carthy’s LP, Shearwater, are informative. If I understand right, Carthy bypasses the Broadside version and expands on a short text by Sir Walter Scott, and sets to a tune learnt from Hedy West. And the riff, surely, is Carthy’s own invention. Forget ‘Scarborough Fair’: ‘The Famous Flower of Serving Men’ is Carthy’s towering achievement. Another running theme, implied rather than declared, is the undeniable blessing of possessing a strong wife. This was the sub-text of ‘The Lochmaben Harper’ and also, in a more backhanded way, ‘The Devil and the Feathery Wife’. Of course, amateur psychology can only get you so far. Let’s not make too much of the fact than an alternative title for another song (performed on his recent tour with Eliza) is ‘The Daughter in the Dungeon’). A word too for Carthy’s highly individual guitar style, with its surging rhythm and syncopated accents, often following the melody line like a second voice. ‘The Third Man Theme’ was a happy choice of encore, bringing black and white film into Carthy’s revivalist remit: as if digesting and embodying the best of all previous folk music was not enough! Undoubtedly Room 412 at the hotel on Calle del Pozo, just off Puerta del Sol in Madrid, is an amplifying chamber, doubling the sound of all the nearby bars, and magnifying it far beyond the level audible on the street. There are always people shouting, as in the UK, with the difference that the shouts in Madrid add to the general merriment, whereas the shouts in the UK tend to be made alone and go unanswered. But last night I slept like a baby, pleasantly exhausted by a full day of Neuroscience at the 10th AIMS Conference on Dynamical Systems, Differential Equations and Applications, the reason for our visit. At one point we were given a tour of the labs. Two fish tanks, blacked out to prevent light reaching their piscine inhabitants, were connected to a computer which intercepted messages from one and relayed them to the other! All this, a Richard Hamilton exhibition at Reina Sofía (The White Album might be his finest hour, as it was the Beatles) and the joyful reunion of Eva and her dear friend Amparo. No wonder I slept soundly. Anyway, in my dream Gil Scott-Heron announced that he was joining the Stylistics. This isn’t as unlikely as all that (reasoned my waking and rationalising self): soul singers, even anodyne pop soul singers, sprang from the same culture as the Black Panthers, and were often one and the same. All that ‘Ain’t Gonna Bump No More (With No Big Fat Woman)’ was merely a cover for more subversive activity. On occasion, even slick orchestral soul acts like, say, The Main Ingredient made surprisingly trenchant social observations. I can quote chapter and verse when I get home. 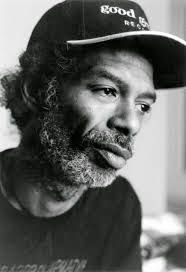 On awakening I remembered that Gil Scott-Heron was dead. So that’s another no-show, I thought. Radical consciousness often appears in unexpected places. There’s no institution like Reina Sofía for celebrating the spirit of Republicanism and mourning the tragedy of the Spanish Civil War. It's the home of Picasso's 'Guernica', after all. Yet the gallery is named after the wife of Juan Carlos, the lately abdicated and disgraced king of Spain. On the other hand, our favourite Madrid bookshop, La Fugitiva, seems to exist as a teashop these days. It’s managed by Clea, who will recommend the best world literature alongside the best iced teas. She called upon me to back her up about George Eliot. “You’ve read Middlemarch, haven’t you, Mike?” “As it happens, I have, in my time. Yes, George Eliot cuts very deep.” All in vain, alas. The customer, from North America, remembered that he had a copy at home, and opted for cheesecake instead. Eva bought a copy of Contra la Ceguera by Julio Anguita. It was the first book Clea had sold all day. It’s easier to sell cake than raise consciousness, it seems. Beer and flesh find more ready takers. which is to say, there’s an awful lot of prostitutes on the streets, from the very young to the very old. And the middle-class are feeling the pinch too, though their response is more respectable. Busking opera singers and classical guitarists rub shoulders with living statues in the main thoroughfares of Madrid. More seriously, a cultured fellow was selling his book collection ranged, like the African immigrants' wares, on a blanket on the ground. This, near El Retiro, the great public park of Madrid. He was having about as much success as Clea. And the gentleman who approached me selling paper tissues had a look in his eyes I shall not forget soon: a combination of pride and shame, amounting to desperation. One of the cheerful figures who greet and pose for snaps with visitors to Puerta del Sol (in return for loose change, if they’re lucky), removed the woollen head of her Minnie Mouse costume to reveal a sweating, anxious, middle-aged Latin American lady. It was equally hot work for the living statues. I recognised the Alien from Alien, a bear (modelled on the statue of bear and tree that adorns Sol) and Jack Sparrow. Jesus Christ enjoyed a quiet pull on his cigarette before mounting his cross. All this tarnished the bliss of a very good trip. I didn’t want for flamenco, sangría and paella. Funnily enough, these were the three things chosen for special approbation by a bar owner in Lavapiés when Eva asked for a glass of sangría. Flamenco, sangría and paella, it seems, form the holy trinity of Spanish tourist cliches. No, one must ask for “tinto de verano”, never sangría, and paella, well, paella was taboo. Eva refrained from saying that she comes from Alicante, the home of paella, and we were just on our way to see Eva’s flamenco teacher, Amelia Vega, perform at a small club, Candela. (Did I say? Eva had taken the opportunity of the conference to enrol at a flamenco dance course at Amor de Dios, above the Antón Martín market.) In the event, I think even the grumpy bar-owner would have applauded a genuine manifestation of Deep Madrid. The concert was marvellous, and incidentally revealed why Madrid has no free jazz scene: flamenco is free jazz. Our siesta was disrupted by a party of English football hooligans. If I said that the English shout alone and go unanswered, I was wrong: there was plenty of unison shouting and singing. Interestingly, their repertoire included ’Starman’ by David Bowie, ‘America’ by Simon and Garfunkel and ‘Dirty Old Town’ by Ewan MacColl, topped by a finale of “Zeig Heil”, the Nazi salute, performed with such gusto that they could only follow with a hasty exit before the police arrived. What would the radical troubadour MacColl have made of sharing such company? The carousing here goes on for 23 hours a day. I say 23 hours because there’s a break between 7am and 8am when the last drunks have staggered home, and the debris is swept away. The once familiar street cleaning machines have been out of action since the great Madrid Garbage Strike of 2013, when City Hall laid off 1,134 of 6,000 cleaners. Since then, Madrid's smart streets have been getting progressively more shabby, and the smell of urine is now all pervasive. No, look, it's been a great holiday (even if last night was the equal of the Argentina win for rowdy noise - a bugle was flourished). So don't think me jaundiced when I say that Madrid is a city overwhelmed by decadence. Always a place of rampant hedonism, the extremes of wealth and poverty, pleasure and misery have been thrown into broad relief by the ongoing crisis of the recession, exacerbated by the most brazenly corrupt ruling class in Europe. There is dissent, and plenty of it, but those in favour of radical and social change are outnumbered by the party people. These days, revellers at pavement cafes are barely disturbed by riot police charging about in their midst, aiming their batons at peaceful protestors. Old-school feminists (we found a very good feminist bookshop, Mujeres Compañía Librería, in Calle la Unión) can only stand aghast at a rising generation who choose to demonstrate girl power by donning uniform pink taffeta and bunny ears and cruise around in a stretch limo yelling excitable things out of the window and otherwise behaving badly (another dubious import from the UK, I'm afraid). All the Indignados and communards who occupied Puerta del Sol on the 15th May, 2011, have so far failed to channel the revolutionary energy of the bellicose drunks of Calle del Pozo. Pics to follow, readers. I have a plane to catch.